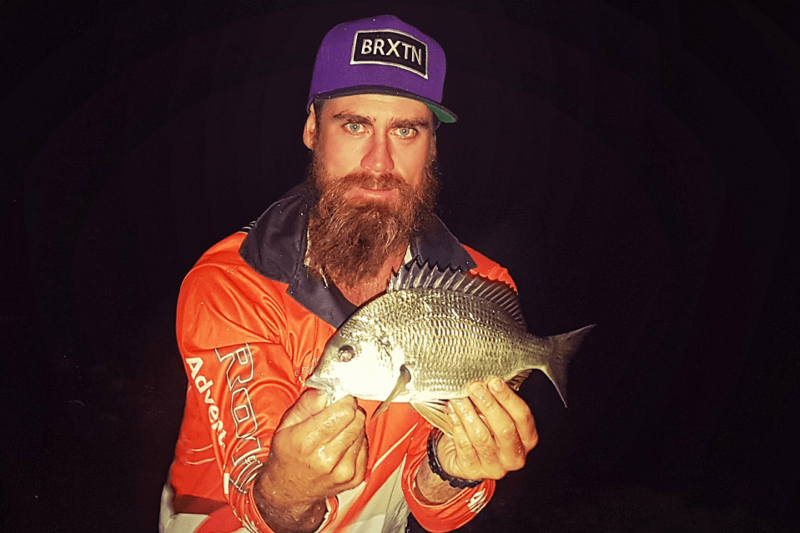 Night fishing at Cabbage Tree Lake on choppy water, Martin Gleason and Paul Harrison from My Catch Australia used their Deeper Smart Sonar PRO+ to catch some Moses Perch and Bream using mullet and chicken breast bait. Fishing at night is always a challenge, though if you get it right it’s a ton of fun and a great time to catch a lot of fish. One issue is seeing structure below the water, especially if it’s choppy. Plus it’s almost impossible to see bait schools or predators chasing bait when you’re fishing at night. So on our latest night fishing trip, Paul and I took along our Deeper Sonar PRO+ to give us an edge out in the dark. Actually, since we got our PRO+ unit it has come with us on every fishing trip. These units are so versatile, they’re well worth having in your tackle box. We were fishing Cabbage Tree Lake and caught up with Dale and Lozza from Rodzilla Adventure Fishing Tackle. By 7.00pm we were wetting our lines. The breeze was up, so the water was pretty choppy which ruled out any surface lures. Paul and I both rigged up bait and cast out, and we cast out soft plastics on a second rod. After sticking with plastics for a while with no luck, we switched to bait we knew would get bites – floating mullet strips and chicken breast. After a while we decided to get our Deeper PRO+ unit to see if we could locate the fish. We attached it to our line and using a Spin Combo we started casting it out and slowly retrieving it back in. The Deeper application started showing data the moment the transducer hit the water, giving us depth readings of 3-4m. Pretty soon we started marking some nice fish arches 10-15m off the shore. We were using the Onshore GPS mode which gives you a mapping feature too (see the screen shots below). This really helped us keep track of where our Deeper was with visibility at a minimum. We found a promising looking drop off of between 3-4m, and could see some big returns sitting on it. So we quickly cast to this are and Paul immediately hooked a Moses Perch. Now we had the fish pinpointed, we used slightly heavier sinkers to get us down to the 3-4m depth. As soon as the tide started running through the inlet pipes were on the bite and made some nice catches. The Deeper PRO+ gave us a nice edge when it came to finding the fish and getting our sinkers down to the right depth. For us, it’s the versatility that we really appreciate – if your out on your boat or kayak, or fishing from land like we were, these units are easy to use and will help you find the fish. The Deeper App has 3 colour palettes, so visibility even at night isn’t an issue. For me and Paul, the Deeper Smart Sonar PRO+ is a great choice if you’re looking for a new sounder. Actually, we can’t recommend it enough. With the Deeper, you’re not restricted to mounting permanently to one boat or kayak. And the fact that you can cast it means now you can scan and map your favourite spots to fish from the land.